Only a couple of minutes left in Friday, and man, what a day! The past 36 hours have kept me rocking and rolling and laughing and enjoying. First of all… remember I shared a while back that I had been selected as a Voices of the Year (VOTY) honoree at BlogHer? And that, although I had been chosen and I was honored, that I was unsure I wanted to fly to New York City and attend? Many of you told me to go, many of you told me to stay home. Fortunately, an internet acquaintance attended… and she snapped this shot for me. Thanks, JP! Look! Gorgeous Lucas and an amazing sunset through my work-in-progress studio window! I’m sure women who attended gleaned a great deal of knowledge, shared ideas, and had fun at the premier blogging event in New York City, a place I haven’t visited since 1975!!!!!!!! Me, though… I’m a different kind of girl. 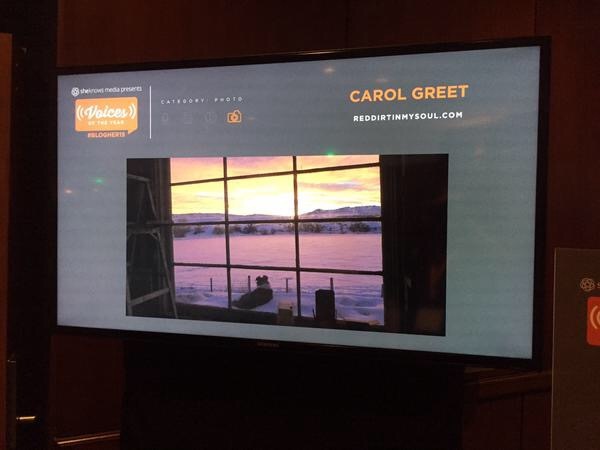 There was a conflict with BlogHer this weekend and Something Else. While many talented women were attending the BlogHer Conference in NYC, I drove two hours yesterday to attend Longmire Days in Buffalo, Wyoming. Sure, I’ve attended every one. Sure, I have almost everyone’s autograph. 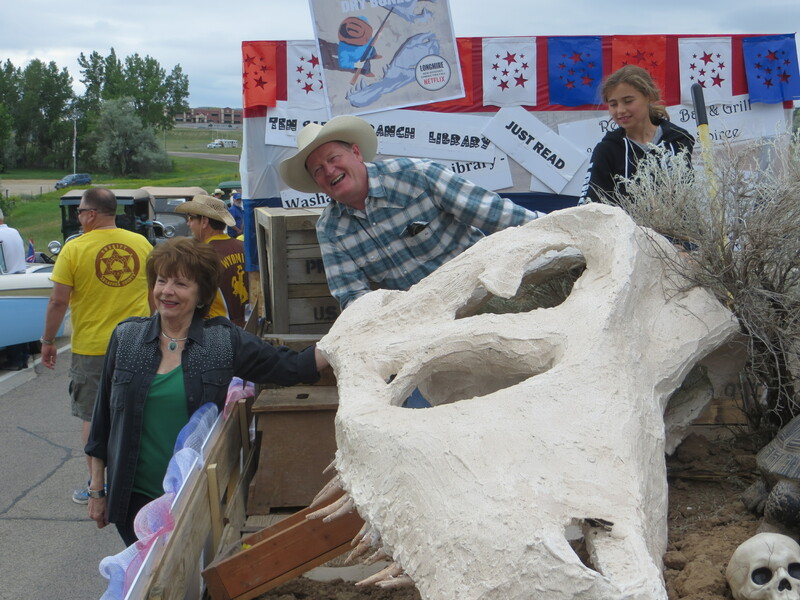 Sure, I’ve heard many of the stories… but this one was special, because Craig Johnson, author of the Longmire series, who was also Grand Marshal of Ten Sleep’s 4th of July Parade, requested we bring the float over for the Longmire Parade. Hey, the boss requests… we’re pretty happy to oblige!!!! We did have to spend three hours gently packing Jen, the T.rex skull, and then strap her down and pray she made it to Buffalo! I’m happy to report Jen made it OK, and we enjoyed the parade!!!! 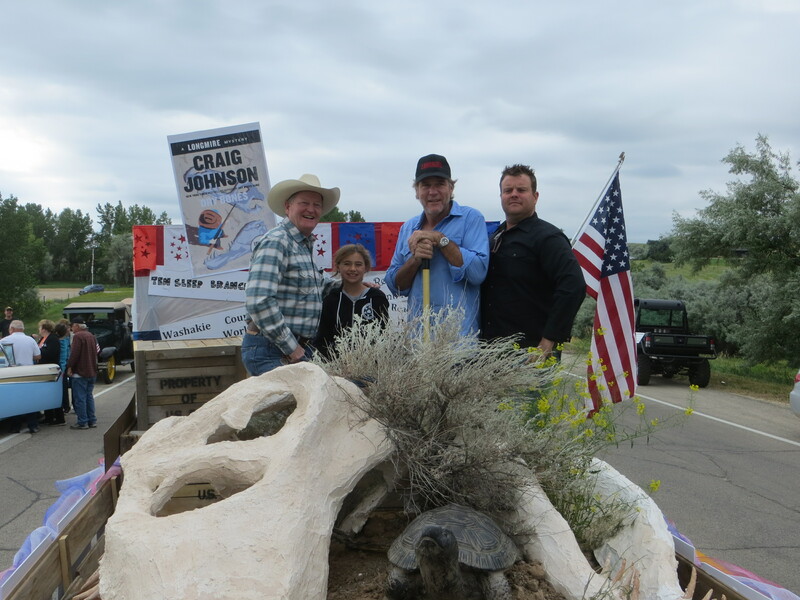 That’s Craig Johnson, granddaughter Lola, and actors Robert Taylor and Adam Bartley on OUR FLOAT! We received tons of compliments and hundreds of photos were taken of Jen, and she couldn’t have been loved any more than today! OK, I have more photos, and more stories, and more laughter… but, I’m headed to bed! The Kids’ Rodeo is tomorrow morning and I have grandkids entered!!!! All in all, I think I made the right choice… the grin on my face is pretty big! Wow, what a day! what an honor! Too bad things always seem to be on conflicting dates but the sunset through the window was thoughtful and beautiful! Your daus are rich with experiences that you so consistently share! Thank you! I thought you should have gone to NYC but considering all that you would have missed, you made the right decision. Congratulations. Oh yes you did make the right choice. Your day sounds wonderful and more tomorrow. Wishing you and grandkids a great rodeo. Wow! Think you made the right choice, sounds like a wonderful time at Longmire Days! I don’t think you would have had nearly the full measure of stories and laughter you got in Buffalo yesterday! Looks like a good time was had by all! I was one who said go, but after seeing that this was the same date, I don’t blame you a bit!!!! I agree! you made the right choice! What a thrill to have your float be a part of TWO parades…and now you can see your grandkids in the rodeo. Enjoy!